Today we officially end Fashion Week. I think its safe to say this year NYFW was pretty epic. I mean a lot went on and not only just on the runway. everyone looked amazing this year. I loved how every designer gave such awesome messages through their designs. its always a topic about the designers and runway models. so let’s talk about some guests who attended fashion week. these ladies were my favorite from street style to the classiest. Ok, first I want to chat about my girl Anaya. Known on social media as theanayal8ter One of my favorite influencers right now. her style is so dope and unique. She carries so much confidence through the way she dresses. And she never fails to bring the confidence with her during fashion week. I love how she mixed high end with fast fashion. My favorite part about this outfit is her Fedora it pulls everything together and gives it that inch of a street style look! These influencers are killing the game. Shayla who goes by Makeupbyshayla killed this entire look. Clearly, as you can see these metallic boots are most definitely the statement piece. I’m also really digging her denim jacket from Jonathan Simkhai. She always comes to serve with such fierce fits! It’s also my first time seeing her attend fashion week so I’m definitely impressed. How can you look at this outfit and not think “Wow she’s cool” or “Wow she’s so stylish” I absolutely LOVE mixed colors and patterns? and I love when women dare to be different! This outfit gives me life!! If you follow her Instagram you’ll see how her style really stands out from the rest. So if you ever need style inspiration just check out her page. Tiffany Reid is like the queen of sass to me. She’s always dress so classy and sometimes chic. I feel like she excites the word classy. I know it was clearly raining in this picture but please believe this umbrella was definitely an accessory for her fit. I command that! Pink and red..one of my most favorite color combinations! Shiona definitely knows how to spice it up. I’ll tell you guys one thing. She NEVER disappoints me when it comes to style…like ever. 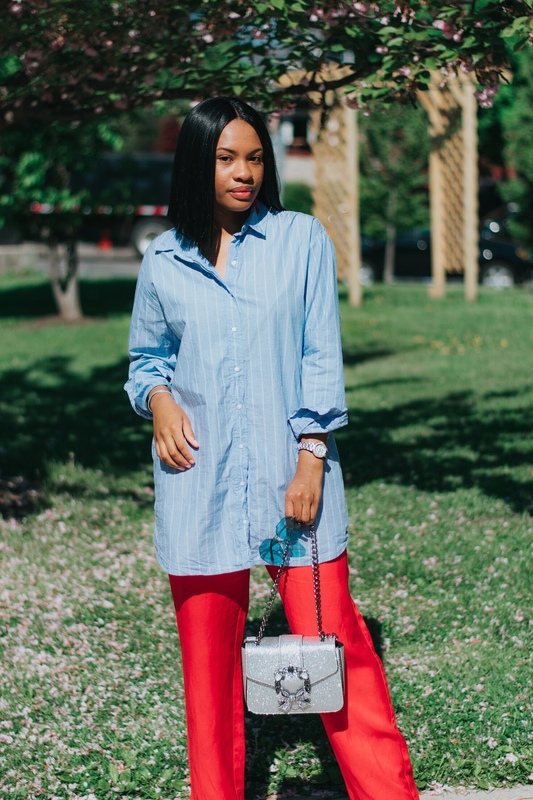 shionat which is her Instagram name is where you’ll find more of her fabulous looks. Everything with this outfit has statements but it’s just enough to where there’s no overload. Absolute favorite. Kahlana gave us such a simple play. But wait not too simple. To funk it up a little she added a pair of Balmain Babette glittered boots. These added some fire to the fit for real. Let’s just all thank Kahlana for the minimal slay. Share some of your favorite looks with me from fashion week! I would love to know what you guys liked and disliked. I hope you guys enjoyed today’s post! and always remember to stay gracious! Next Who’s Ready For Fall skincare Products?